Mexico, 1886-87, 1c-25c Numeral issues, cut-to-shape proofs, set of 15 proofs on India cut-to-shape and mounted on brown card with gold bordered frames, each with security punch hole, includes 1c, 2c & 5c in U.P.U. 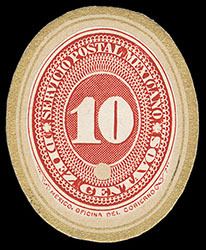 colors, the 1887 scarlet colors 3c-25c, 5p & 10p high value and the unissued 50c, 1p & 2p values, Very Fine, this set is believed to be unique, probably issued for high postal authorities. Scott No. 165P//229P Estimate $2,500 - 3,500. 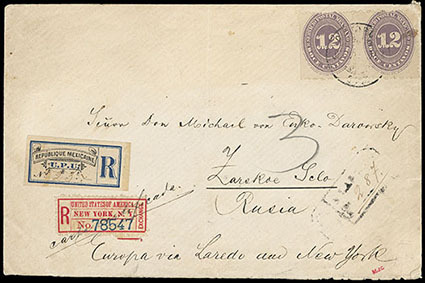 Mexico, 1886, Numeral unwatermarked, 12c lilac, perf 12, horizontal pair, on 1884 registered cover to Russia, Mexico & New York etiquettes and appropriate transit backstamps; cover edge wear and file fold, F.-V.F., a very rare destination. Scott No. 181 Estimate $150 - 200. 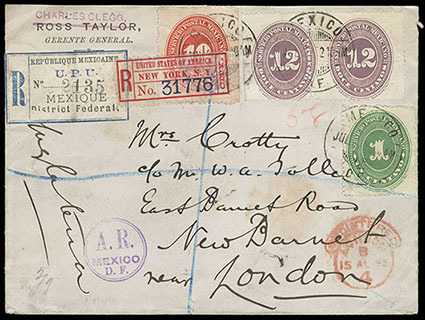 Mexico, 1886, Numeral unwatermarked, 12c lilac, perf 12, horizontal pair, in combination with 1890, 1c green + 10c vermilion (212+218) on 1892 registered cover to London, England, all tied by Mexico cds with Mexico and N.Y. "City" registry etiquettes, Very Fine. 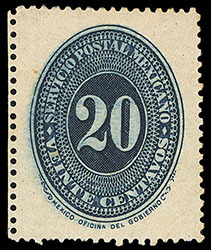 Mexico, 1886, Numeral, 20c proofs, perf 12, two on stamp paper; one in issued lilac color (no gum, small thin), other in blue with o.g., well centered, Very Fine, both are believed to be unique; each with 2005 M.E.P.S.I. certificate. Scott No. 182P, 182TC Estimate $250 - 350. 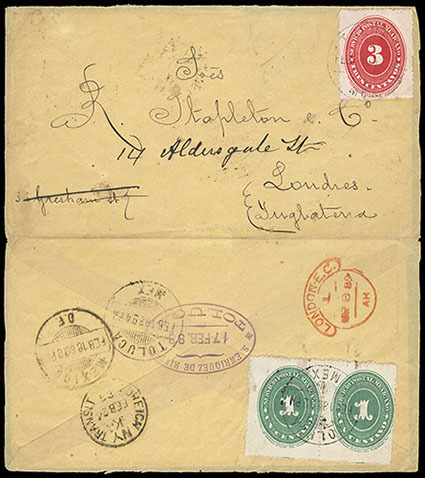 Mexico, 1887, Numeral unwatermarked, 3c scarlet, perf 12, in combination with 1886, Numeral unwatermarked, 1c yellow green, perf 12, pair on reverse of cover from Toluca to London England, paying the rare 5c subsidized rate as the correct rate to Europe was 10c and there is no sign of postage due, appropriate transit backstamps; cover opened at sides for display, Very Fine, underpaid covers are very seldom found. Scott No. 184+174 Estimate $150 - 200. 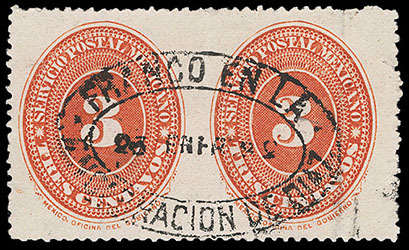 Mexico, 1887-90, Numeral issues, imperf between, two horizontal pairs, 1887, 6c red unused (o.g.) and 1890, 3c vermilion canceled in Encarnacion de Diaz, Very Fine. Scott No. 186a, 214b Estimate $250 - 350.